Less than 1 1/2 Blocks to vibrant & hip U Street Metro (Green/Yellow lines). New listing - just had our first guests this weekend! Near Trader Joes, tons of restaurants & bars. In Heart of City - in trendy U St Corridor - 3 blocks from 14th St & 2 blocks from 9th St (lots of restaurants, bars, movie theatre) and Shaw & Bloomingdale. Not far from White House & Capitol. high ceilings, lots of light). I live in Main House - just bought many of the new items to furnish the large English Basement with a large bathroom (double vanity), (bed, couch (with sleeper mattress), 2 fireplaces, large tile flooring with some rugs, Stainless Steel Refrigerator High ceilings, freshly painted. Queen size bed and sleeper sofa that folds out - also have an air mattress that can be used if needed. Hi - this is my home. I live in the main house & hope my guests enjoy my English Basement. My wife and kids live out of town, so I'm away a fair amount of time, and love the neighborhood, where I work and enjoy. It's a nicely renovated basement that I lived for awhile when I first bought the home, and designed it where I would enjoy living. 2 brick fireplaces, large bay window, plantation shutters, recessed lights, double vanity, dishwasher, washer/dryer in the unit. So close to vibrant U St, 14th St & 9th Sts - full of restaurants & bars. A little over a block to U St Metro - Capital City Bikeshare, close to downtown. Fun, a centrally located home. On a great area (U Street Corridor near Logan Circle, Shaw, Dupont & Adams Morgan. Easy to get downtown, White House, the Capitol and all around. 1 1/2 blocks to the Metro (U St/Cardozo), Capitol Bike Share or Uber, Lyft or Cab almost anywhere. It's such a fun neighborhood - U St, 14th St, 9th St & so many neighborhood bars/restaurants to enjoy. Window unit available for Bedroom, and Portable one available, yet most renters have not found it necessary in past as there is a nice ceiling fan in the Living Room. Radiator and electrical baseboard in Living Room. Yes - there is a stackable washer/dryer in the unit. 2 fireplaces - one does not operate in the front room; one does in the rear room. Contact me for details - guests are able to get up to 14 day parking pass for no charge. Otherwise 2 hour street parking available on 1 side of street unless one has a DC Zone 1 sticker or pkg pass. There is one, but I use it. If it's something that is imperative, pls contact owner to discuss for an additional charge. Will provide details for Wi-fi Broadband upon Acceptance. Yes, towels, wash cloths are provided. Inoperable, but a hot plate is available - located on top of stove. Dishes and utensils in cabinets. Refrigerator (with a 2nd smaller refrigerator if needed), Dishwasher, Stove not operable, but a hotplate is available and located on stove, microwave. There is a small bar in kitchen and 4 bar stools available. Capital City Bike Share and other Bicycle services are available to rent. May be difficult as there are 5-6 steps down to access English Basement. Great place for our girl's trip! We enjoyed our stay at Kent's place. Kent was quick to answer any questions and even came down to be sure we had everything we needed. He was very helpful, giving us restaurant recommendations and directions. The apartment is close to the U St. Metro station. We found several restaurants nearby. The CVS next to the metro was a convenient place for miscellaneous forgotten items. We really enjoyed our stay at Kent’s place. It is a quick Uber ride to all of the national mall attractions. Lots of local color and fun restaurants. Thanks for making your place available Kent! My husband and I stayed in Kent's basement apartment over the New Year. The location couldn't be better. Very easy to take the metro to and from all the landmarks, airport, etc. The neighborhood was quiet enough, and we were able to walk everywhere with Trader Joes, Starbucks, a great pizza place, and CVS all within walking distances. As for the apartment, it was clean and the beds and linens were all very comfortable (at 32 weeks pregnant I can vouch for that). As stated in the description, the building is older. The stove/oven do not work and the kitchen is tiny (there is a burner where we could boil water and cook eggs). We wanted to cook a bit more and it made it a bit challenging, although we made a few meals work. I would say if you are looking to cook a lot this apartment may make it difficult. There isn't really a table to sit at either. There is also no cable/TV and I think in the description it says there is? Bathroom is nice and spacious although shower is also small, but water pressure is great. Overall, a few quirks and an interesting layout, but we were comfortable and pleased with our stay. Oh also--Kent was very accommodating and even went to get us a parking pass that we needed over the holiday weekend. My sister and I stayed in this lovely apartment for four days in November. It was a perfect home base for us while we explored Washington, D.C. The apartment has two rooms with a queen size bed in each. The beds and bed linens made the beds super comfortable. The neighborhood is quiet so we slept great each night. The bathroom is very large with two sinks making it easy to get ready in the morning. There is sufficient hot water and a good showerhead in the shower. We ate most meals out during our visit but we did have breakfast in the apartment. We used the coffee maker and a nice surprise was an electric kettle. We didn't do any cooking. The location of this apartment was ideal. It is possible to walk to the White House (1.4 miles) which we did in order to check out the restaurants but most of the time we walked the few short blocks to the subway. There are many good restaurants in the surrounding neighborhoods as well as a Trader Joes. We are not late night people; however, due to the time of year, we were coming home in the dark every night. We never felt unsafe walking in the neighborhood as two older women. We were able to walk or take public transportation everywhere we wanted to go. We parked our car when we arrived and didn't use again until we left. The owner (Kent), could not have been more helpful and accommodating even going to the Police Dept. the day before our arrival to get us a parking pass. He checked with us periodically to make sure things were going OK and was available to us by message or phone. Our one regret is that he was out of town during our stay and we did not get to meet him in person. 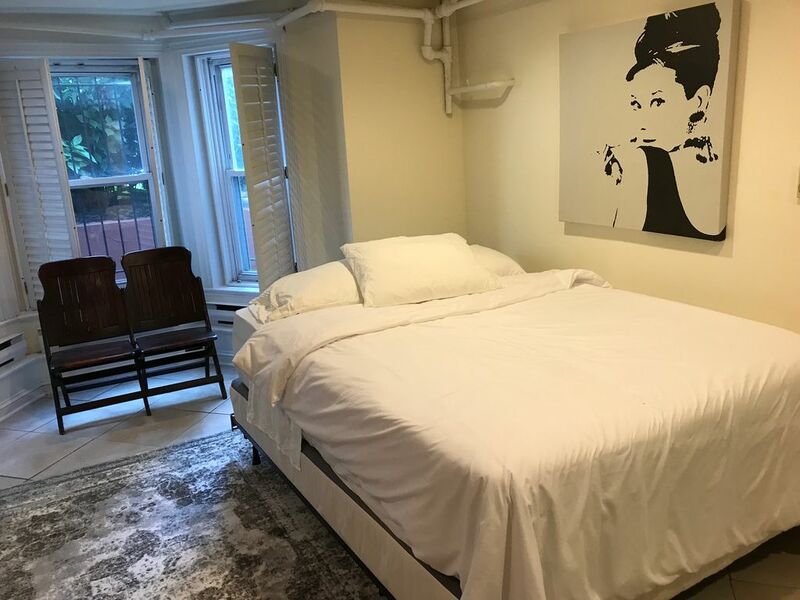 This apartment is a great value for anyone visiting D.C. and I would want to stay here again the next time I visit. Great location for my meetings on Rhode Island and the Renaissance Hotel/ Convention Center. As noted by the host, this is an older building so beware. I didn't like the two shower heads in the shower or the AC system approach. Spacious, charming apartment - great location and value! This was our first time trying a VRBO and we could not have gotten luckier. The bedroom and living room are large and have wonderful lighting; linens are of a very good quality; and the bathroom has a double vanity which was great. Even though we were close to U Street, we never heard any nighttime noise. Quick easy walk to the Metro. Kent was an amazing host - he provided thorough information for check-in, including specific directions from the Metro and recommendations for a couple of local night-spots worth trying. We had a few questions when we first arrived and he responded immediately. We look forward to staying here again! Trendiest part of city. 1 1/2 block to Metro (Gr/Yl) In heart of U St Corridor - 3 blocks from 14th St (Trader Joes, Yes! Organic - Whole Foods at 14th & P Sts NW) many restaurants. Close to Soul Cycle on 14th & many restaurants/bars - Vinoteca (wine bar), Sollys, 1/2 block away. Bin 1301 Wine Bar, Dino's, Al Crostino, Dukem & Etete (2 best Ethiopian restaurants in DC), Nellies Sports Bar, The Prospect (new sports bar), Archipelago, The Fainting Goat (new American - with several local farming options), Tico, Lost Society, Ben's Chili Bowl, Ben's Next Door, LOT Lounge, Oohs & Aahs (great soul food - featured on Food Network's Diners, Drive-Ins and Dives), The Greek Spot (wonderfully authentic), Alero, Brixton, American Ice House, (all within 3 blocks away). 4 Coffee places - The Coffee Bar - 2 blocks away on 13th & S, Starbucks, The Wydown & Peets. Also nearby - Matchbox, Ted's Bulletin, Busboys & Poets, Marvin, new YMCA on W between 13th & 14th (with very nice swimming pool), Vida (very nice fitness center with swimming pool) on 1600 block of U. 3 Blocks to 9 30 Club (considered by many as one of best venues on East Coast), Lincoln Theatre, U St Music Hall (within a block) & Howard Theatre next to all the new restaurants on Florida and 7th St NW in Shaw. New O St Market with new Giant Grocery at around 9th & P. Capital City Bikeshare within 1-2 blocks. I am the owner and live in upstairs part of house. All Information deemed reliable, but not guaranteed.